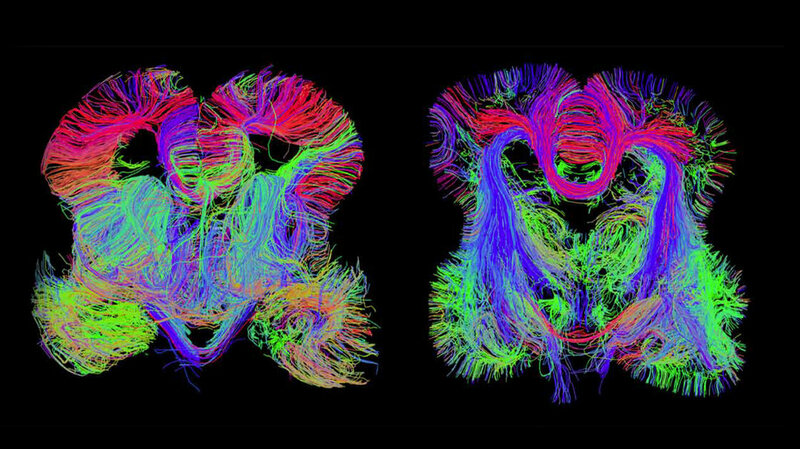 Images of the developing fetal brain show connections among brain regions. A high-resolution map of the human brain in utero is providing hints about the origins of brain disorders including schizophrenia and autism. Having a map like this is important because many psychiatric and behavioral problems appear to begin before birth, “even though they may not manifest until teenage years or even the early 20s,” says Dr. Thomas Insel, director of the National Institute of Mental Health. The human brain is often called the most complex object in the universe. Yet its basic architecture is created in just nine months, when it grows from a single cell to more than 80 billion cells organized in a way that will eventually let us think and feel and remember. “We’re talking about a remarkable process,” a process controlled by our genes, Lein says. So he and a large team of researchers decided to use genetic techniques to create a map that would help reveal this process. Funding came from the 2009 federal stimulus package. The project is part of the BrainSpan Atlas of the Developing Human Brain. The massive effort required tens of thousands of brain tissue samples so small that they had to be cut out with a laser. Researchers used brain tissue from four aborted fetuses, a practice that the Obama administration has authorized over the objections of abortion opponents. Researchers tested each sample to see which genes were turned on and off in each tiny bit of brain. This helped the team figure out which types cells were present at specific points in the brain and what those cells were doing, Lein says. And the map tells researchers who study these disorders where in the brain they should be looking for signs of trouble, Lein says. For example, the map shows that genes associated with autism appear to be acting on a specific type of brain cell in a part of the brain called the neocortex. That suggests “we should be looking at this particular type of cell in the neocortex, and furthermore that we should probably be looking very early in the prenatal stages for the origin of autism,” Lein says. The second important finding from the mapping project, Lein says, is that the human brain is different from a mouse brain in ways researchers didn’t know before. These differences could explain why a number of brain drugs that work well in mice have failed badly in people. The map also reveals just how little scientists had known about the brain of a fetus. That realization is already helping to explain the complex role that genes often play in brain disorders, Insel says. For example, researchers have been puzzled by some of the genes that appear to be involved in autism and schizophrenia because their function in the adult brain didn’t seem to have anything to do with the disorders.